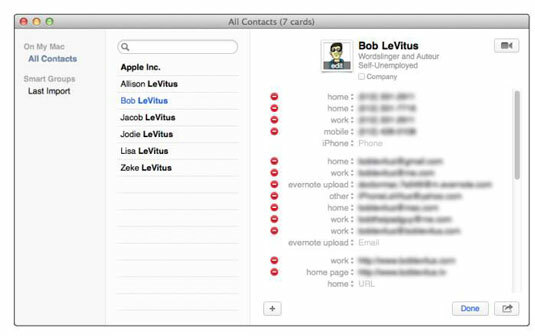 OS X Maverick’s Contacts stores and manages information about your family, friends, and anyone else you want to keep in touch with. It works seamlessly with the Mail and Messages applications, enabling you to quickly look up e-mail addresses when you’re ready to send an e-mail, text, or start a chat. Use with FaceTime to video chat with friends and family. Use with Calendar by choosing Window→Address Panel or pressing Command+Option+A. You can then drag any person in your Contacts from the Address Panel to any date and time on the calendar, and a special Meeting event is created automatically by Calendar. The event even has a Send Invitation button; if you click it, it launches Mail and sends the person an invitation to this meeting. Very cool stuff. The Contacts application can also work with any other application whose programmers choose to make the connection or with any device that is compatible with Contacts. 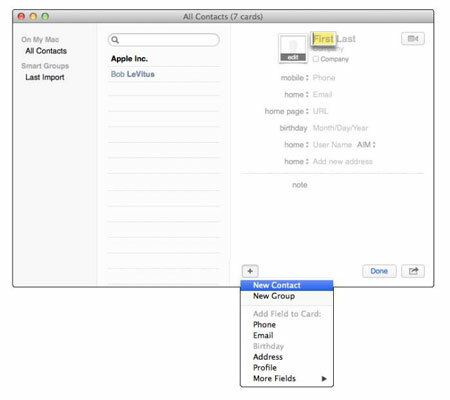 For example, FileMaker’s Bento application exchanges data with Contacts seamlessly, so changes made in Contacts appear in Bento (and vice versa) almost immediately. It’s also available in most programs that have a Share button or menu so you can share with your contacts via whichever method is appropriate, usually their e-mail or .Mac address (for iMessages). If you use iCloud, you can sync contacts with devices that include (but are not limited to): other Macs, iPhones, iPads, and iPod touches. Launch the Contacts application by double-clicking its icon in the Applications folder, clicking its Dock icon, or clicking its Launchpad icon. To create a new entry, click the + button at the bottom of the Contact card and choose New Contact from the drop-down menu. Type the person’s first name in the First text field. Type the last name for the person you’re adding to your Contacts. Here type LeVitus. Continue this process, filling in the rest of the fields. When you’re done entering information, click the Done button to exit the editing mode. The little triangles (actually up and down arrows) between the labels and their contents fields are pop-up menus that offer alternative labels for the field. For example, if you were to click the arrows next to the word Mobile, you would be able to choose Home, Work, Main, Home Fax, Work Fax, Pager, Other, or Custom to replace the label Mobile. To add more info about any Contacts entry, click the name in the list on the left. You can tell when a name is selected because it’s blue instead of black. Click the Edit button at the bottom of the Contacts window, and make your changes. If you already have contacts you created in another program, you might be able to import them into Contacts. Contacts can import contacts in vCard, LDIF, or Text file format. The first thing you need to do is export the data from the other program in one of these formats. Then choose File→Import→vCard (or LDIF or Text file, as the case may be), choose the exported data file in the Open File dialog, and then click the Open button. Why would you want to organize your contacts into groups? The main reason is practical: you can send e-mail to everyone in a group that you’ve defined with a single click. Launch the Contacts application by double-clicking its icon in the Applications folder or clicking its Dock icon. To create a new group, choose File→New Group, press Command+Shift+N, or press the + button at the bottom of the window. An untitled Group appears in the Group column with “Untitled Group” highlighted. Type a descriptive name for this group and then press Enter or Return. Click All Contacts on the left side of the window to show all your contacts on the right side. Click the contacts you want in the group from the contacts list. 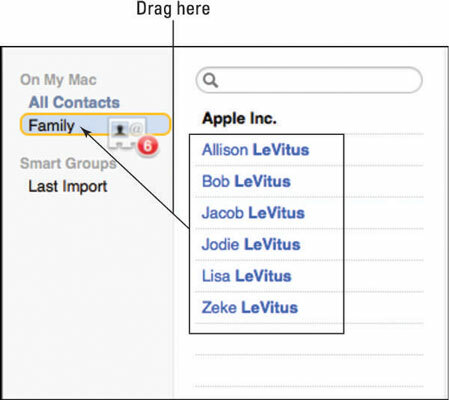 Hold down the Command key as you select contacts if you want to select more than one contact. Drag the selected contact names onto the group. Contacts considerately displays the number of contacts you’re dragging, which happens to be six in this instance. A second type of group — called a Smart Group — might be even more useful to you. A Smart Group gathers contacts in your Contacts based on criteria you specify. So, for example, you could create a group that automatically selects Apple staff members. Choose File→New Smart Group or press Command+Option+N. A Smart Group sheet appears in front of the Contacts window. Give the Smart Group a name. Select the appropriate items from the menus: Any, Company, Contains, Email, and so on. Here’s a Smart Group that includes any contact that contains Apple in the Company field or @apple.com in any e-mail field. When you’re happy with the criteria specified, click OK.